Miami Dolphins tight end Charles Clay (42) can't hang onto a pass from quarterback Ryan Tannehill as New York Jets defenders Ed Reed (22) and Antonio Allen (39) close in during the first quarter Sunday. MIAMI GARDENS, Fla. — In the franchise’s biggest game in years, the Dolphins failed to show up Sunday afternoon at Sun Life Stadium. Miami allowed the rival Jets — already eliminated from playoff contention — to play spoiler in a 20-7 loss. The Dolphins (8-8) needed a win and help from Cincinnati or Kansas City to clinch their first postseason berth since 2008 and second in 12 seasons. Instead, New York (8-8) backed head coach Rex Ryan, while Miami scored just seven points over its final two games. 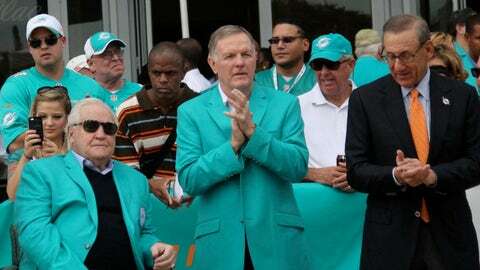 Don Shula, who was inducted into the Dolphins' Walk of Fame, offers up his thoughts on the current team. Geno Smith, who attended Miramar High School and won the 2012 Orange Bowl with West Virginia, started the game 1 for 4 before completing six straight passes in the second quarter. The second-year player closed out the first half 9-for-15 with 126 yards and an 87.1 passer rating. He finished 17-for-27 with 190 yards. More importantly, he didn’t turn the ball over and managed the offense. 2. New York’s ground game. In the 23-3 victory over the Jets on Dec. 1, the Dolphins defense struggled to stop the run early on before solving the attack, allowing 125 yards on 35 carries (3.5 average). Miami held New York to 22 yards on seven rushes through one quarter on Sunday. Koa Misi tackled Bilal Powell behind the line with 10:20 left in the second on a crucial third-and-inches play. But the Jets would close the half with 91 yards on 21 carries for a 4.3 average. Both touchdowns came on the ground. Defensive tackle Sheldon Richardson’s 1-yarder capped a 10-play drive. Geno Smith scrambled five times for 32 yards in the half (45 overall). His 7-yard touchdown, in which he broke a couple of tackles, gave New York a 14-7 lead with three seconds before halftime. Powell led the Jets with 76 yards on 21 carries. Seven players combined for 155 yards on 39 rushes. New York entered with the sixth-best rushing game, averaging 133.6 yards per game, while Miami ranked the eighth-worst in rushing defense, allowing 122.9 yards per game. 3. Miami’s absent rushing attack. A week after running the ball just three times in the 19-0 loss to the Bills, Lamar Miller got as many touches by the second drive. The yardage, however, wasn’t there — 10 combined yards on eight carries by Miller and Daniel Thomas. Miller ran five times for 19 yards, including a 12-yarder, on the 14-play scoring drive. On the opening drive of the third, Ryan Tannehill dashed 20 yards on third-and-21. 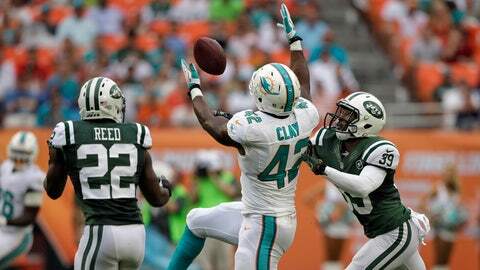 The Dolphins elected to go for it on fourth down, and Charles Clay was stopped for no gain. Miami was seventh-worst in the NFL with 89.9 rushing yards per game. The unit tallied 92 yards (73 for Miller). Tannehill was just one yard shy of last week’s passing total (89) against the Bills after one quarter on Sunday. Through the first 15 minutes, Tannehill had connected with six receivers. Brian Hartline, who collected his second straight 1,000-yard season to become one of four in Miami history, hurt his left knee and did not return. During the 14-play, 89-yard drive, Tannehill completed third-down passes three times. Tannehill beat the blitz for a 5-yard touchdown to Mike Wallace. Following the first Jets touchdown, the Dolphins failed to respond. On a second-down incompletion, a flag was thrown for pass interference. It was called back. On third-and-6, Rishard Matthews dropped a pass with room to run. Miami took over from its own 10 on the second possession of the third and marched down the field. One play after Tannehill and Wallace couldn’t connect in the end zone, the latter slipped and Dee Milliner intercepted the ball. Both Ed Reed and Milliner picked off throws late in the fourth. Tannehill finished 20-for-40 with 204 yards, one touchdown and three interceptions.